We're used to seeing gratuitous #FoodPorn pictures posted to Instagram on a daily basis, but some users are claiming their accounts have been commandeered, with unsolicited fruit-based posts appearing on their profiles. 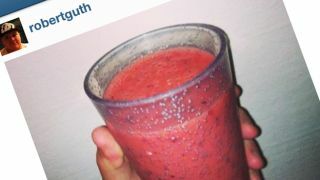 A significant number of users have taken to Twitter claiming shots of fruit and smoothies have been posted without their knowledge, forcing some to reset their passwords, while locking others out completely. The photos feature text encouraging users to try out a new diet, while broken web links (made to look like they emanate from the BBC) have been added to affected users' bios. It's the second time in as many months some users have come under attack in this way, following a similar incident in June, and the motives of the hackers remain unclear. Google Ventures filmmaker Graeme Hancock was among those affected, tweeting: "Big security breach definitely happening on Instagram. This is the third hacked account I've seen including mine." Instagram is yet to comment on the breach and it's unclear whether passwords of more users have been harvested by the hackers for future use. Unless you want your Instagram account acting all fruity too, we'd recommend a quick password change. Have you tried the new Video on Instagram feature yet? Check out Facebook's bid to give us all 15 seconds of fame.